November is here. 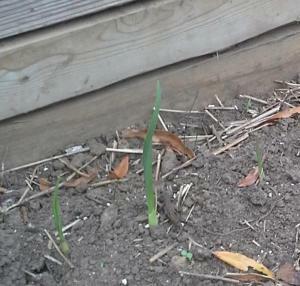 The October garlic is in – most of it. We wish we had planted more. The pole beans are still producing. We wish we had planted more, way back in July, before we ran away from the August heat to a family vacation. ld have planted more. The carrots might grow big enough before the ground gets hard – I plan to help hold the heat with a very thick layer of straw (an idea I took from an old Ruth Stout article in Organic Gardening magazine). The fall planting of broccoli and cabbage are hesitating – will they subside into food for caterpillars? or grow gorgeous green heads?